Lady Dawgs basketball team can place anywhere from third to not making the postseason. The Lady Dawgs had a tough home 63-32 loss to No. 1 ranked Kennedy Jan. 28, but bounced back to beat No. 8 ranked Santiam 51-27, in Santiam. The Lady Dawgs played a tough Colton team at home Feb 1, but could not close out the Vikings in a 42-39 loss. The Colton loss was a big one for Culver as they moved to 6-6 in league. The Lady Dawgs traveled to play No. 11 ranked Gervais (16-7 overall, 9-4 in league) on Feb. 5, passed the Madras Pioneer deadline and have their senior night at home against Western Christian (12-10 overall, 8-5 in league) on Thursday. Culver lost to both Gervais and Western Christian earlier in the season and needs to win both games in order to make the postseason. "It is all or nothing now," Fritz said. "We win both games and everything goes as predicted, then we are looking at a three way tied for third. We have the tiebreaker over Santiam, Santiam has the tiebreaker over Western Christian, and Western Christian has the tiebreaker over us. It will be interested in seeing how it will turn out because that third spot is huge." "If we win one and lose on then we will be in the fifth spot," he said. "The team will have an away game instead of at home too. If we lose them both, there is a big chance we are out of the postseason. That is pretty crazy to think because we have been ranked in the top 10 all but three days all season and we could be in a situation where we are sitting at home watching the whole thing." "When I took over, the goal was to make the conference playoffs," he said. "Now, we don't even talk about conference playoffs, just state playoffs. I never even envisioned not making the conference playoffs. It is on us to make sure we win and if not were going to be sitting at home." A long stretch of not finding the basket in the second half made all the difference in the Lady Dawgs 42-39 loss to Colton Feb. 1. It took a while for either team to score, but a few minutes into the game a post up by Nena Mendoza gave Culver a 3-2 lead. Mikayla Haessler found an open Kiana Webb for a jump shot and great ball movement led to a 3-pointer by Irma Retano. Retano worked hard for a putback score and Mia Gamboa assisted on a jumper to Webb. The Lady Dawgs took a 12-2 lead at the end of the first. The second quarter was a defensive battle with Colton outscoring Culver 8-6. The Lady Dawgs took an 8-point lead at the half. The Viking came into the second half determined to bring a fight to Culver. Colton forced the Lady Dawgs to turn the ball over several times and go on a quick 7-3 run before the Viking called a timeout down by two. An inbounds play tied the game at 21-21 and Gamboa left halfway through the third quarter with a head injury. Colton kept trying to extend their lead, but Retano and the Bulldogs kept fighting through a tough quarter. Retano used her athleticism to grab a offensive rebound and score on a putback. She later used fancy footwork to nail a stepback 3-pointer. 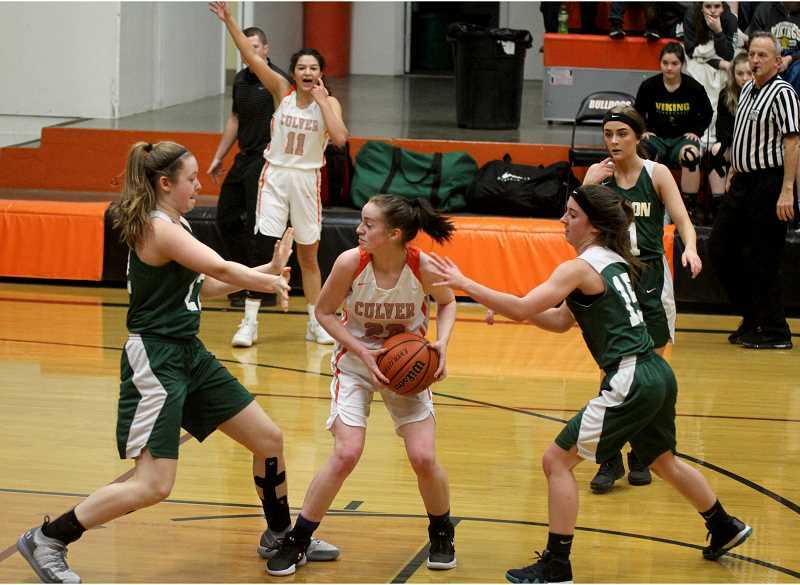 Culver looked like they were going to head into the last quarter down by 2-points, but Colton banked in a desperation 3-pointer and the Lady Dawgs went into the fourth quarter down 31-26. Gamboa returned the game for the final quarter, but Colton scored six unanswered points and head coach Scott Fritz called a timeout with the Lady Dawgs down by 11. After the timeout Retano and Anyla Rico both made 1-of-2 free throws and Gamboa hit a deep three. The Viking hit a big 3-pointer late in the game, but it was match by an Retano 3-pointer and a few plays later, Haessler hit a mid-range jumper. Colton called a time out with 1:12 left in the game and Culver was down by only four. Gamboa fouled out of the game with 36 seconds left and Colton hit 1-of-2 free throws. Retano ran down the court and nailed another shot from behind the arc and Culver called a quick time out down 41-39 with 16 seconds. The Vikings were able to bank in one free throw and the Lady Dawgs had a chance to tie the game, but missed a deep three and a mid-range jumper, losing the game. Retano was the leading scorer with 21 points, nine rebounds and six steals. Gamboa also added 6 points and four rebounds for Culver. The Lady Dawgs played their best game of the season, beating Santiam Jan. 30. Culver had very balanced scoring and their press was too much for Santiam. "This was our most well rounded and best played game of the year, both offensively and defensively," Fritz said. "We were successful in our press and they were ranked No. 8 at the time. We dominated the entire game, jumping out to a big lead and never surrendering it. They were frustrated and Nena Mendoza was so outsized, but she worked her tail off in the post and our perimeter players put a lot of ball pressure on Santiam." The Lady Dawgs took a 25-13 lead at halftime and outscored Santiam 17-8 in the final quarter to come away with a big victory. "It was unbelievable effort and I was really proud of them," said Fritz. "That is the thing about this sport though. It will take you to the highest of high and three days later, to the lowest of lows." Retano led the Lady Dawgs with 18 points, eight rebounds, six assists, and five steals. Gamboa was right behind her with 14 points and six steals, while Mendoza shot 4-from-4 from the field, 2-for-2 at the stripe, scoring 10 points. 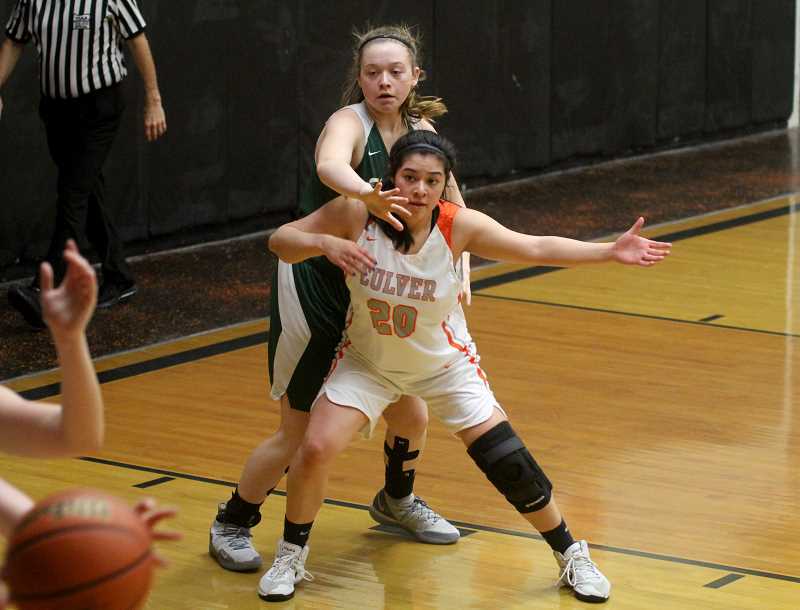 Culver could not get things going in the first quarter against Kennedy Jan. 28, being were outscored 22-9. The Trojans were able to get to the rim with ease, but the Lady Dawgs switched to a more aggressive defense and outscored Kennedy 14-11 in the second quarter, going into halftime down 33-23. Culver battled hard against the Trojans and was able to cut their lead down to only 7-points. Kennedy went on a big run in the last quarter of the game and close out the quarter, outscoring Culver 17-2 and sealing the victory over the Bulldogs. Gamboa ended the night with 12 points, and two assists, while Retano had 7 points, five rebounds and four assists. Webb also ended the game with 7 points. "Overall It (the loss) did not bother me to much," Fritz said. "They are a darn good team."